For many people, building their own solar panel system and living off-grid is becoming a reality instead of a dream. Connecting the solar panels directly to a bank of batteries may work, but is not a good idea. A standard 12 volt solar panel which can be used to recharge a battery, could actually be putting out nearly 20 volts at full sun, much more voltage than the battery needs. This difference in voltage between the required 12 volts need for the battery and actual 20 volts being generated by the solar panel translates into a greater current flow into the battery. The result is that too much unregulated solar current will overcharge the battery causing the electrolyte solution within the batteries to overheat, resulting in a shortened battery life and ultimately, complete failure of the battery. Then the quality of the charge will directly affect the life of any connected battery, so it is extremely important to protect batteries of a solar charging system from being overcharged, or even undercharged, and we can do just that using a battery charge regulation device called a Charge Controller. A battery charge controller, also known as a battery voltage regulator, is an electronic device used in off-grid systems and grid-tie systems with battery backup. The charge controller regulates the constantly changing output voltage and current from a solar panel due the angle of the sun and matches it too the needs of the batteries being charged. The charge controller does this by controlling the flow of electrical power from the charging source to the battery at a relatively constant and controlled value. Thus maintaining the battery at its highest possible state of charge while protecting it from being overcharged by the source and from becoming over-discharged by the connected load. Since batteries like a steady charge within a relatively narrow range, the fluctuations in output voltage and current must be tightly controlled. Prevent Battery Over-charging: This is too limit the energy supplied to the battery by the charging device when the battery becomes fully charged. Prevent Battery Over-discharging: Automatically disconnect the battery from its electrical loads when the battery reaches a low state of charge. Provide Load Control Functions: Automatically connect and disconnect the electrical load at a specified time, for example operating a lighting load from sunset to sunrise. Solar panels produce direct or DC current, meaning the solar electricity generated by the photovoltaic panels flows in only one direction only. So in order to charge a battery, a solar panel must be at a higher voltage than the battery being charged. In other words, the voltage of the panel must be greater than the opposing voltage of the battery under charge, in order to produce a positive current flow into the battery. Solar Electricity Handbook - 2015 Edition: A simple, practical guide to solar energy - designing and installing solar PV systems. When using alternative energy sources such as solar panels, wind turbines and even hydro generators, you will get fluctuations in output power. A charge controller is normally placed between the charging device and the battery bank and monitors the incoming voltage from these charging devices regulating the amount of DC electricity flowing from the power source to the batteries, a DC motor, or a DC pump. The charge controller turns-off the circuit current when the batteries are fully charged and their terminal voltage is above a certain value, usually about 14.2 Volts for a 12 volt battery. This protects the batteries from damage because it doesn’t allow them to become over-charged which would lower the life of expensive batteries. To ensure proper charging of the battery, the regulator maintains knowledge of the state of charge (SoC) of the battery. This state of charge is estimated based on the actual voltage of the battery. During periods of below average insolation and/or during periods of excessive electrical load usage, the energy produced by the photovoltaic panel may not be sufficient enough to keep the battery fully recharged. When the batteries terminal voltage starts to drop below a certain value, usually about 11.5 Volts, the controller closes the circuit to allow current from the charging device to recharge the battery bank again. In most cases a charge controller is an essential requirement in stand-alone PV system and should be sized according to the voltages and currents expected during normal operation. Any battery charge controller must be compatible with both the voltage of the battery bank and the rated amperage of the charging device system. But it must also be sized to handle expected peak or surge conditions from the generating source or required by the electrical loads that may be connected to the controller. There are some very sophisticated charge controllers available today. Advanced charge controllers use pulse-width modulation, or PWM. Pulse width modulation is a process that ensures efficient charging and long battery life. However, the more advanced and expensive controllers use maximum power point tracking, or MPPT. Maximum power point tracking maximizes the charging amps into the battery by lowering the output voltage allowing them to easily adapt to different battery and solar panel combinations such as 24v, 36v, 48v, etc. These controllers use DC-DC converters to match the voltage and use digital circuitry to measure actual parameters many times a second to adjust the output current accordingly. 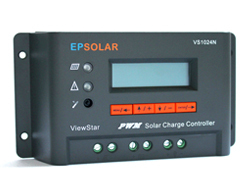 Most MPPT solar panel controllers come with digital displays and built-in computer interfaces for better monitoring and control. We have seen that the primary function of a battery Charge Controller is to regulate the power passing from the generating device, be it a solar panel or wind turbine to the batteries. They assist in properly maintaining the solar power system batteries by preventing them from being overcharged or undercharged, thus offering long life to batteries. The solar current being regulated by a solar charge controller not only charges batteries but can also be passed to inverters for converting the direct DC current to alternating AC current to supply the utility grid. For many people who want to live “off grid”, a charge controller is a valuable piece of equipment as part of a solar panel or wind turbine power system. You will find numerous charge controllers manufactures online, but choosing the right one can sometimes be quite confusing and to add to your worries they are not cheap either, so finding a good quality solar charge regulator really matters. It’s best not to go for those low quality cheaper ones, as they may actually harm the battery life and increase your overall expense in the long run. For a little peace of mind then Click Here and check out some of the better battery charge controllers available from Amazon and learn more about the different charge controllers available as part of your solar power system helping you to save money and the environment. I am planning on installing an off grid solar battery system using lead acid batteries. I currently have 22 solar panels installed connected to the grid. It is my intention to remove the grid inverter and install a Sunnyboy Island inverter, a power controller and a bank of lead acid batteries. Could I receive advice on the best size and model power controller I will need to set up this system. If possible could I receive advice on the number of 12 volt lead acid deep cycle batteries I will need for a load of approximately 20 amps. I have got Hulikkar Battery Bicycle(Medlay) 26″. I like to add Solar Panel with Bicycle and controllable with this cycle. Is it available with you and its price. Do you send it to cash on delivery and how many days it will take. H.NO 87 KESAR BAGH COLONY, NEAR N.I.S. I have purchased sixteen 12-volt deep cycle batteries, each with 134 amp-hours @ 20 hr rate. I plan to wire two sets of 8 batteries each in parallel to increase my amp-hour capacity, and then to wire these sets together in series to increase the voltage to 24 volts. My question: Can I still charge this bank of batteries with my 12-volt windturbine, my 12-volt solar panels, and my 12-volt battery charger? My project will use a 300W solar panel to supply power to a 50W load and a 250W pump. The PV will will run through a regulator to a battery. The power will go from the battery to DC/AC Inverter. The AC will then power the load and the pump. The pump will take water from a 55 gal drum (A) and cycle it to another 55 gal drum (B). When the battery power drops below 12.1V a valve will open in drum B and take the water to to a turgo runner connected to an alternator. The alternator will supply the power to the system until the battery voltage reaches 12.7V, when the valve will close.The water will go back into drum A after it powers the alternator. Can I wire the AC voltage from the alternator directly to AC voltage from the inverter? Do I need a battery regulator of some sorts? How can make sure I don’t blow the load and pump? Do you see any flaws or problems?